Two tries in the opening 15 minutes were enough for England to see off a brave and resourceful Irish challenge today at Esher - but not without the loss of their clean sheet as Ireland came back at them hard. In what sounds like a game dominated by forwards (full report on ScrumQueens - who also provided the photograph right), the Irish seem to have done remarkably well against a much bigger English pack. Third place - or even runners-up - is still a real possibility for the Irish who will take a lot of positives away from today's game. Ireland's next game in two weeks time is at home to Wales, who had a shocking game today against France (WRU report) , failing to capitalise on their chances in the first half before fading badly in the second and eventually losing 15-3. The Welsh coach was clearly not happy -"It was a poor performance and everyone is understandably disappointed. We need to be beating sides like that if we are where we think we are in the world game." Finally Scotland's roller-coaster Six Nations continued as they snatched a draw - the first in their history - in Italy, coming back from 6-0 down at half-time to finish 6-6 (Scrumqueens report). France now jump into second place on four points - but they have yet to play England and so cannot expect to finish on more than six points. On the other hand Ireland and Wales have both played the English, so whoever wins in Ashbourne can expect to finish level on points with the French. Based on recent performances that really could be the Irish, which will be a great boost for the World Cup. "There are two camps in the perception of the women’s game — those who admire it, and those who have never seen it"
Rochelle Clark, Amy Garnett, Heather Fisher. Key members of the England team - you have to wonder what they make of the publicity other squad members get. Because there is another profile of an England player in today's Sunday Times and, as is the predictable way for feature writers, it focuses on one of that trinity of players who always grab the headlines. This time its not Cathy Spencer, or Maggi Alphonsi, but instead its Emily Scarratt's turn. Again. Actually the men's game is barely any different - for every Jonny Wilkinson there are probably half a dozen forwards who could wander down Twickenham High Street without the risk of being recognised - but it would be interesting to hear more about, say, Fiona Pocock occasionally. Fortunately the article does redeem itself by being quite a good read, though it does tend to go over the same ground that has been covered before. For example, it makes a point about how Emily is one of the new breed of England players who have played since the were children (rather than starting to play at university), but actually that does now apply to most (if not all) of the current England team - the days when you could switch into rugby from another sport in your late teens and still find your way into the England squad a few months later are long gone. However, there is an interesting mention of Emily's punishing week - she is a student at Leeds Met, though where on earth she finds time to study it fails to reveal. Perhaps of more interest are the words of England coach Gary Street, about how he emphasises the physicality of the team - that they should be strong and uncompromising (which certainly showed against New Zealand), as well as team traditions such as presentation ceremonies for team shirts. Overall its good to see national newspapers like the Times writing about the game, but it would be nice if they could come up with something original. Like proper match previews, match reports, and maybe an acknowledgement that there is more than one home team in the Six Nations. Due to the exceptionally heavy overnight rain all of our pitches are flooded and we have reluctantly had to postpone our Thames Valley league fixtures against Berkshire Baa-Baas. Also, given the conditions, there will be no training today. ... it could be worse - you could be playing in Sweden. "The climate in Sweden obviously poses a slight challenge, so during the coldest months our main focus is on fitness in the gym - or in a metre of snow if you're brave! - interspersed with a few "indoor" rugby camps. "Now, when I say "indoor", I actually mean a big tent with artificial grass and a temperature the same as outdoors. "At last week's camp I realised that you learn something new at every camp, even at my age. I learnt that when playing rugby at -18ºC, fill your bottle with warm water or it'll be frozen even before the warm-up has finished!" The Women's Six Nations wakes up from its break with a Super Sunday of three games, all starting within one hour of each other. Between two and three o'clock on Sunday Wales will host France, Scotland will travel to Italy, and Ireland will play their 100th international away to England at Esher. Unlike the last round there is the potential for upset in all three matches. Wales should beat France who are very poor travellers, but you never can tell with the French - on paper they have the ability to push the Welsh close. Equally Scotland should be too strong for Italy, but two years ago the Italians ran out 31-10 winners and last year they pushed both Ireland and France close in their home games. And finally, Esher, Ireland have never won against England, and that is unlikely to change, but they have been far from disgraced in recent years. Ireland's defence has improved year on year, and in Niamh Briggs they possess one of the most reliable kickers in the women's game. England are certainly taking no risks - they have selected their strongest possible side for Sunday's game. Could Herts 7s 2010 be the best yet? The 2009 Herts 7s at OAs looked hard to beat, but news from Tring RFC - hosts for 2010 - is that they already have 32 teams for the U12, U15 and U18 competitions three months ahead of the event. A few places remain but already most of the familiar names from across the south and midlands we all know so well are already signed up, including Worcester, London Irish, Newquay Hornets (their first Herts 7s I think), Thomas Becket School, Paviors, "Jimmies", and Oakmedians, as well as league rivals Oxfordshire, Middlesex Leopards and Bucks Jesters, plus the "locals" Welwyn and Hertford. Its a really exciting line up at what has become a major tournament of national importance - arguably second only to the National Sevens. Its also normally played in glorious sunshine (as opposed to the nationals, where most years it seems to rain) - a nice thought after another week of snow and freezing winds! One of the great "casualties" of the new RFU website was the apparent loss of the forum section, where anyone could take part in discussions on... well, virtually anything. This included a women's rugby section that certainly got the attention of RFUW on several occasions so it was a valuable tool. The good news therefore is that they are back - well, in theory as when I tried to get in this evening they were down, but they clearly have been working. RFU say that the archive of forum posts and threads was maintained and is available to view on the new site. To access the discussion forums, log into www.rfu.com with your log in and password from the old website and then visit www.rfu.com/forums. This Sunday (February 28th) we have Thames Valley league matches against Berkshire Baa-Baas for both U15 and U18 Letchworth Saracens teams. The games are scheduled to kick off at 2pm at the Letchworth ground. Can all players please meet at the Letchworth club by 1pm. As we are temporarily without pitch floodlighting, training this week will be indoors on Thursday evening starting at 6pm. Will all players please bring trainers. BBC Radio 4's "Woman's Hour" included a really excellent interview with Catherine Spencer today - click here to listen via iPlayer (UK only for the next seven days - starts 34 minutes) or download a Realplayer file of the interview (which may be available overseas). ScrumQueen also have a transcript of edited highlights. 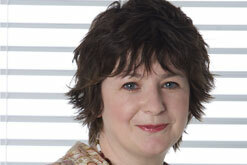 She is talking with Jane Garvey (left) - one of the best interviewers at the BBC at the moment IMHO (having been interviewed by her myself I feel I know!) and, although she obviously knows little about the game, she is well briefed and asks some really good questions. The interview also includes a BBC rugby reporter - Sarah Orchard (right) - who I confess to not having heard of before, but she is very passionate about the women's game (though I'd disagree about what she says about BBC coverage, especially for teams other than England!). "The thing about the men's game at the moment is that there is so much territorial kicking and in addition to that , men have been playing for so long they are almost too professional. They can almost cheat the laws every so slightly. You don’t get that with womens rugby. You get a much purer version of the sport, and that is better for the spectator to watch. If you appreciate the game you will get a better game if you watch the women’s game." What do you think? Personally - other than 10 minutes of mayhem at the recent Wales v Scotland men's game - I'd have to agree! This comfortably the best and most professional interview I have heard on women's rugby - especially on a generalist programme. It couldn't possibly be because all the participants are female, could it?? News reaches me that Sydney scored two tries in her first matches for East Region U15s today in their games against Thames Valley and South East at Old Albanians. East won both games, with Sydney playing throughout. Both Jess and Chloe also played the U18 games - with Chloe touching down twice against South East and once against Thames Valley in two more East victories. Full scores and details will appear on the Herts blog shortly. Training for both U15 and U18 Letchworth Saracens players will be at Letchworth starting at 12.30pm. As this is our last combined training session before our next league games (against Berkshire Baa-Baas on 28th February), attendance is very important. A couple of signs this week that the inclusion of sevens in the Olympics may be having an effect on the international game. The first was the US Sevens in Las Vegas where the women's tournament, where the national teams from France and Germany, two strong USA teams, and a Canadian Students team, all lost out to China. USA White - close to a full strength US national team - lost 10-0 to the Chinese in the final. China has been a significant power in Asia for some time, but spectators at Las Vegas came away saying that they have improved significantly since last season, when they won the Bowl tournament (9th place) at the World Cup, and would probably made at least the quarter-finals today - if not better. This will clearly not be the last tournament China will win. One event they will certainly have in their sights will be the next (and last) Sevens World Cup, in 2013, and - in a significant sign that another non-traditional rugby nation is starting to take the game very seriously - this looks like being held in Russia, after they put in a bid to host the event today. With Brazil and Germany withdrawing their bids they currently have a free run. Russia will also be hosting this year's European Sevens tournament, as well as the men's Junior World Trophy - all of this has happened since the Olympic announcement. Once Russian women had to finance their international rugby campaigns by selling vodka - not any longer. That is two "sleeping giants" who are showing signs of stirring. With six years still to go before the Rio Games the "traditional" rugby countries are not going to have it their own way. RFUW coach in TV "bank raid"
Kevin Moggridge is one of the RFUW's few paid officials - he was appointed as one of the South West's Club and Coach Development Officer a year or so ago, and is responsible for development girls and women's rugby in Somerset, Cornwall and Devon. However it would appear that he may have been neglecting his duties of late, or at least his mind may have been elsewhere, because recently he has been holed up in a hotel in the North East plotting a raid on the bank at Channel 4's "Deal of No Deal". And today was his big day. What does come over is that Kevin is clearly an inspirational guy, and why he must have been a significant factor in the recent improvements in standards in South West South. From the start he swore that it was his day and he would beat the banker - but as you see it all came down to the wire. 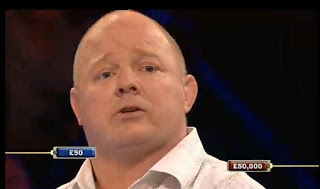 Enjoy his agony on 4oD - does he go home with £50, or £50,000? You can also "enjoy" Mr Edmonds purile comments about the game -"do they really go at it" indeed. Personally I think I'd have hit him with the box, but you have to admire Kevin's restraint - although his neck injury may have been a contributory factor. Thanks to Carla for tipping me off about this - before anyone suggests that daytime quizzes form a significant part of my half-term activities! A new career option for the rugby mad? Up until now the options for rugby mad girls wishing to combine career with opportunities to play have been largely limited to the Services, and especially the army. Indeed this has been the chosen path for at least one ex-Legend, though she has been heard to complain that the army had clearly got its priorities wrong as the soldiering had an annoying tendency to get in the way of the rugby. However the services are not for everyone and for those wishing you follow a career path which does not include trips to Camp Bastion, there is now an alternative as this weekend the England Fire Fighters' Women's team will be playing their first match against Newcastle University. The men have had a team for some years - and at least one male legend has played for them. They regularly play against police and armed services teams, and now Stuart Irwin - the Fire Service director of rugby - and responded to growing demand for a women's XV. And it should be a pretty decent team, as it will be captained by ex-England international - Helen Durman (who also played for Saracens), who now works for the Northamptonshire Fire Service. The competition that grew out of RFUW's still largely inexplicable cancellation of the National 10s last season has grown even bigger and has already "sold out", over two months before the event. Gloucester City 10s had one of the most troubled births of any competition ever last season - at times you almost believed that someone, somewhere didn't want it to take place for some reason - but was a huge success, despite only having last minute clearance from those in authority. This year it seems to have been far less troubled and as a result Lisa Holmyard (the indefatigable organiser) has now announced that she has closed the entry. The tournament on 17th April will feature an amazing 42 teams and over 600 players in three age bands - U12, U15 and U18. So a big congratulations to Lisa and all her helpers at the Gloucester Girls Rugby Trust. If nothing else it shows how the junior game continues to grow! Sometime late this evening - or possibly early tomorrow morning - small celebration is maybe due as this little news service, supporting a small girls team in north Hertfordshire, will pass 100,000 hits - achieved in just under four years. Remarkably the number of daily hits is still growing - even on relatively quiet days it can pass 100 (at the time of writing there are only 41 hits to go to the 100k). And we are - according to Wikio - the number one rugby blog again (which I find hard to believe, actually) - probably a short term thing due to coverage of Emily Valentine, but also due to Invicta, which has generated a lot of traffic! Quite a lot of the hits have been due to this being - for a long time - pretty much the only independent source of information on women's rugby, including international rugby so one good development is that we are no longer alone. At least two "proper" news services, devoted to the women's game, have now started up (Scrumqueens and women's section of Heavensgame) who are now almost invariably beating this blog to the stories (as they should!). Its great, long overdue, and with the World Cup hopefully just the start. England cantered to a seven-try victory over Italy in Parma this afternoon. Despite making several changes from the "first choice" side who beat Wales last week, and making still more changes throughout the game, Catherine Spencer's team racked up 41 unanswered points against an Italian team that, by all accounts (see RFU match report), rarely challenged for points. It took only three minutes for Hertfordshire's Michaela Staniford to start England on their way, and by half-time England were 22 points ahead. Four team changes did little to slow the scoring down, and the steady flow of points continued right to the end when Catherine Spencer touched down for her second try. Next up for England is a home game against Ireland, followed by trips to Scotland and finally France - but the title should be done and dusted long before then. With 72 unanswered points from 160 minutes of play so far, the Red Roses (to use the "nickname" that the RFU are now calling the team) are on awesome form. In 2007 England shutout every team they played... except for France, who sneaked in a couple of late tries at Old Albanians. Who would bet against England putting that right this time round, and not conceding a point to anyone? Sunday: Wales returned to winning ways with a relatively straightforward 28-12 win over Scotland. Four tries - all converted by Non Evans - meant that the home side were rarely troubled (see WRU match report). However, the result leaves Wales in fifth place on points difference behind the Scots. The championship now takes a break before returning for what looks like being a fascinating weekend in a fortnight's time. Emily Valentine film now available! The funniest rugby advert.... EVER! Rugby player aims to be "Last Woman Standing"
Invictus. Go and see it.